Citation Information: J Clin Invest. 2010;120(7):2254-2264. https://doi.org/10.1172/JCI41246. The BCR-ABL1 oncoprotein transforms pluripotent HSCs and initiates chronic myeloid leukemia (CML). Patients with early phase (also known as chronic phase [CP]) disease usually respond to treatment with ABL tyrosine kinase inhibitors (TKIs), although some patients who respond initially later become resistant. In most patients, TKIs reduce the leukemia cell load substantially, but the cells from which the leukemia cells are derived during CP (so-called leukemia stem cells [LSCs]) are intrinsically insensitive to TKIs and survive long term. LSCs or their progeny can acquire additional genetic and/or epigenetic changes that cause the leukemia to transform from CP to a more advanced phase, which has been subclassified as either accelerated phase or blastic phase disease. The latter responds poorly to treatment and is usually fatal. Here, we discuss what is known about the molecular mechanisms leading to blastic transformation of CML and propose some novel therapeutic approaches. 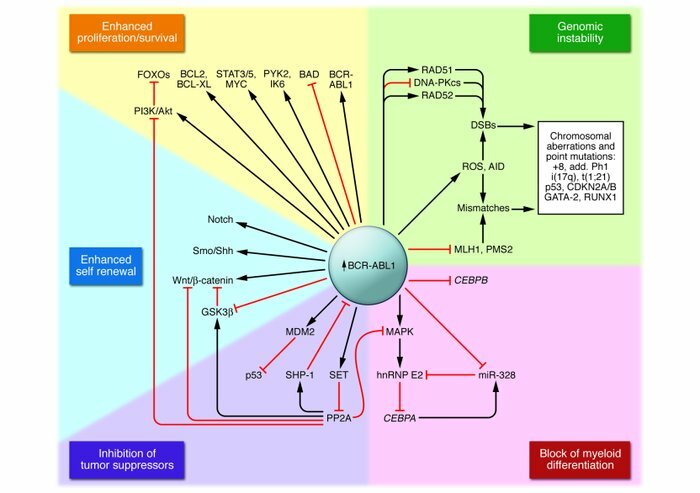 BCR-ABL1–dependent pathways to blastic transformation. Schematic representation of the potential BCR-ABL1–dependent molecular mechanisms leading to CML disease progression.The relatively high BCR-ABL1 expression/activity in CML-CP CD34+CD38– stem cells and/or CD34+ early progenitors compared with more committed progenitors, which is further markedly increased in CML-BP CD34+ progenitors results in the following: enhancement of proliferation/survival pathways; increased genomic instability; and activation of pathways leading to a block in myeloid differentiation, acquisition of the ability to self renew, and inhibition of tumor suppressors with broad cell regulatory functions. BAD, BCL2 antagonist of cell death; DNA-PKcs, DNA-dependent protein kinase, catalytic subunit; FOXO, forkhead box O; IK6, Ikaros 6; miR-328, microRNA-328; MLH1, mutL homolog 1; PMS2, postmeiotic segregation increased 2; RAD51, RecA homolog in Escherichia coli; RAD52, RAD52 homolog (Saccharomyces cerevisiae); Shh, Sonic Hedgehog; wnt/β-catenin, wingless-int1/beta-catenin.